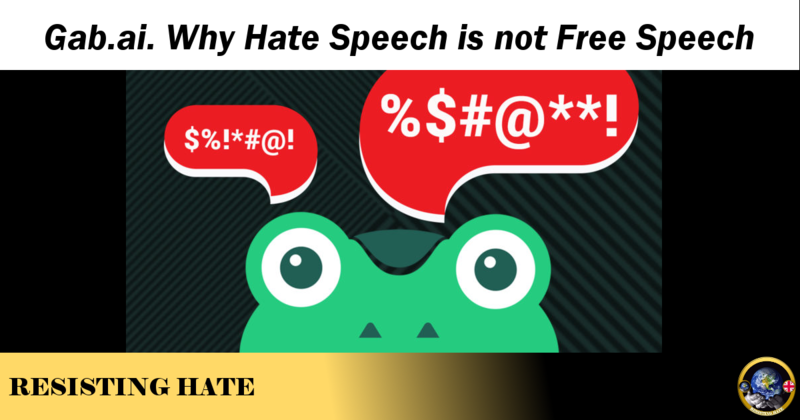 The no platforming of far right white supremacist hate site Gab.ai this week has reignited social media’s favourite debate topic of free speech v hate speech. Gab was taken off line after it was shown that the terrorist who committed the Pittsburgh shooting was using the site as a platform to share his anti-Semitic views and to gain validation for his hate from the echo chamber of anti-Jewish and anti-Muslim prejudice that Gab had become notorious for. Shooter Robert Bowers even used the platform to announce his attack only minutes before opening fire inside a Synagogue. I wrote a piece on Resisting Hate showing the reactions of fellow ‘Gab’ members in the immediate aftermath of the shooting. The celebratory posts and the gleeful support for this atrocity were indicative of the climate of hate on Gab that I had been monitoring for several months. The site quickly degenerated into a cesspit of trolling, Anti-Semitism, Islamophobia, Racism and anti LGBT prejudice. It was the site on which Jonathan Jennings (recently jailed for 16 months) posted his death threats toward Jeremy Corbyn, Gina Miller, myself and others. High profile events were reported with bias and lies – I documented this racist response (unmoderated by the platform) to the Royal Wedding. The exposure of the extremism on Gab led to support for it being pulled by payment providers PayPal and Stripe, domain owner Go Daddy and Server Host Joyent. This effectively closed down the site. Andrew Torba has vowed the site will be up and running again soon but has failed to comprehend that every law enforcement agency in the world will be watching it. Gab if not yet actually dead is certainly in its death throes. There has been a backlash on social media relating to the shutdown of Gab with many complaints that deplatforming a social media site is in violation of the American constitution, namely the first amendment – the right to the freedom of speech. It is my view that hate speech does not constitute free speech. I do not believe that the freedom to speech should involve the right to abuse other people, to post their private information and to call for violence and mass genocide against them. To put this in terms that the far right will understand. I detest Donald Trump. I believe I have the right to express my opinions of his politics on any platform of my choice. I have the right both on American and British soil to criticise the man, the decisions he makes and the impact he is having on both his own country and the world. I do not have the right to assume that every Christian holds the same beliefs as Donald Trump and I do not have the right to demonise the faith by seeking to use one individual as a representative of it. I do not have the right to find private information and pictures of Republicans who support Donald Trump and post them over the internet with calls for people who agree with my politics rather than theirs to commit violence against them. I do not have the right to accuse Republicans with whom I disagree as being ‘paedophiles’ and circulate their pictures with this accusation in public forums. I do not have the right to call for Donald Trump supporters to be harmed, abused, violated or killed. Simply put, expressing my views is free speech, abusing others is hate speech. All of these examples I have provided are genuine illustrations of how the members of Gab.ai conduct themselves. They use the guise of free speech to excuse themselves from posting threats, abuse and hatred that create an environment where the weak minded are radicalised into far right extremism. Their supporters will tell you ‘it is only words’ but these words created the conditions that led to Robert Bowers massacring innocent people at worship in a Synagogue. Death and violence are the real life consequences that result from hate speech. Gab supporters are missing the point. Nobody is trying to silence free speech. If they wish to express their opinion in a way that does not contravene the boundaries of human decency then they are welcome to do so. They are welcome to converse, to express, to debate and to discuss. What they are not welcome to do is abuse, demonise and vilify others in the process. The belief that the ‘big tech’ of the internet is looking to silence conservative voices is a fantasy borne from far right paranoia. The aim is the eradication of hate speech, not conservative speech. Though the question the right leaning supporters of Gab should be asking themselves is why so many self-proclaimed conservative voices cannot see the difference between the two. “Anti-racism” is not worthy of debate. It’s cult indoctrination. The anti-racist guru, who is usually a Jewish academic or some kind of discussion or meeting facilitator uses the same psychological method as cult leaders. They break down the white subject completely. They attack their entire identity and social grounding by telling them that the entire system of their lives, their society, family, country, church, everything is built on an immoral foundation of racism, already established as evil. All resistance to this is attacked as a priori further evidence of it. There is no way out of it. Speaking up against this view itself becomes an immoral act. Resistance is totally crushed in this way. Those that do not resist are immediately praised and built up as moral heroes. This is all done in a context where the facilitator has authority, usually school setting or a disciplinary one, with a heavy implication of punishment or ostracism for not accepting it and social rewards for going along with it. The guru then moves on to providing the white subject a new identity of “anti racist” or “working for change” in which the actions of the subject are now up for review by the guru based on their own criteria. All future actions of the subject must now perpetuate the new identity. This is why these people seem like crazed religious cultists. They are. They have gone through a form of psychological manipulation and abuse that has torn them down and built them back up. They must necessarily see those stuck in “old ways” as evil like their previous selves.